I saw this interesting situation on my daughter's facebook. 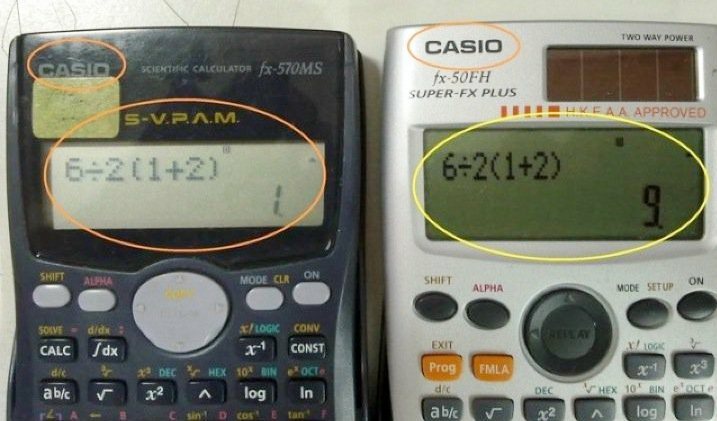 Two Casio calculators cannot agree on the answer. The discrepancy came about because of ambiguity in the way formula is written! At the first place, Casio should have just reported "Syntax error". First, 6÷2(1+2) is not the same as 6÷2*(1+2) from the way machine will interpret it. Updates: My reader Brendan gave a link to support 9. This link looks at the whole situation from mathematical correctness! Worth reading. From my logical thinking without bringing in all the "legality" point of view, 6÷2(1+2) is simply 6÷2(3)=9, ie, evaluating form left to right! So, do you agree with the professor's argument from the link above? For me, I am not concerned but just to remind ourselves that accuracy in entering formula into a machine is important. All this argument is academic which we leave it to the professors. my answer would've been 1 too. when bracket comes into play, u have to solve whatever it is inside the brackets. say if x[a+b(d-e)], you'll still solve (d-e) first before you times the answer with b, then u add with the a, then only you multiply by x.
plus, the question should've been (6/2)(1+2) if you want the answer to be 9.
thats what i recall... from my rusty maths knowledge. The weather is terribly warm. answer is one. what u typed in the calculator is actually the formula on diagram 1 too. also, + - * /.... plus minus multi then divide. so the equation has to be times/multi then only divide, when not in brakets. Very interesting... if anyone starts to argue about this, I think it won't end. So, in my humble opinion, Casio should have rejected this entry because it is technically ambiguous. 2(1+2) is the same as 2*(1+2). multiplication and division have the same priority level. The answer is nine. 2(1+2) is supposed to be the same as 2*(1+2). But now, we are talking about how the machine interpret the result. If the two were entered into a spreadsheet, the first one will be "illegal". Putting aside all mathematical technicality, I will logically take that 2(1+2) is one and will be evaluated first to give 6. Your second link gave the argument based on "technicality" and it is very interesting! I will also buy his argument from his learned point of view. SO, the result is 9, which agrees with my first thought. a ÷ 1a = 1 ALWAYS. It is NOT a ÷ 1 * a = a². That is ridiculous. This proves that 1a = (1a) and (1 * a). 1a is not the same meaning as 1 * a. 6 ÷ 2(2+1) ? Ans: 1 Proven with the laws of math. caper26, thanks for your thought. That is why maths is so interesting! Answer is 9. 1 is wrong. Why is it when people use numbers, they use a different rule set than algebra? Anyone with a solid mathematical background will know the importance of factorizing. In this particular instance, a 2 was factored from 2 terms inside the parentheses. It is illegal to use this 2 as an operand on its own without restoring it to the other terms first. What people fail to understand is what properties ARE in maths. in a larger expression or equation and STILL GET THE SAME SOLUTION. Here, a = b = 2, and c = 1. I have seen people try to argue that a = 6/2. If that were the case, the expression would then look like (6/2)(2+1). This is not how the original equation looks, however. solve what is inside parentheses without it"? What? Really? in that you are getting a different answer without it, which means THAT solution is wrong. Properties are there for proofs, and to make solutions "more apparant" if there is confusion. This is exactly what the distributive property does in this case: It removes the so-called "ambiguity". There is no ambiguity here, only a right and wrong answer.